Possible screen match of RS Propmasters helmet? The RS Propmasters stunt helmet has some features that are distinct and unique from other helmets. The contour of the undercut along the right hand side of the faceplate has some particularly interesting features. Just in front of the bottom of the ear you'll find a parallelogram-like shape; then where the line of the mouth meets the undercut there is a triangular-shaped divot and a sharp angle turn downwards; and finally the distinctive "crater" about 1 inch beneath and behind the tube opening. These could be a basis for screen identification if other helmets do not also have these features (this I have not verified). While looking at screen captures from ANH, I ran across one specific helmet that appears to match closely these faceplate undercut features. Consider the first trooper in the front row. Could this be the RS helmet? the RS helmet is also in every scene where large groups of troopers are shown. 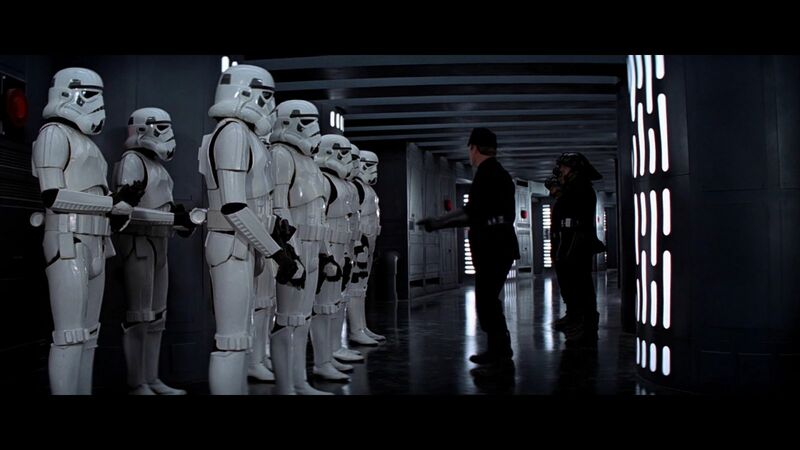 in the tantive hallway he is clearly in the scene, since his holster is rare in shape and design. I recall reading thread where the holster and certain individual armor parts were identified on-screen as being part of the RS suit. I didn't think the RS helmet itself has been identified in any specific scene. If it has, I missed that thread! I haven't talked publicly about this match, but spoke to TM a long time ago and he was considering the same helmet as you are suggesting, as the RS helmet. It's worth noting that the same helmet is also missing the neck rubber trim, just like the RS helmet is missing it. I've also forwarded those thoughts to Simon of RS about a year ago. I consider it a likely candidate, but so far, it's still too hard to make a 100% positive match, but it is the best candidate to my knowledge. My spotting it was mostly luck. I was actually trying to find helmets that had different characteristics than the RS. Instead I found one that looked a lot like it. While I appreciate it's not 100% percent positive match, it's exciting that we independently homed in on this particular helmet. And I actually admire that RS didn't come out and promote "the screen match has been found" after you discussed this possibility with them. The confidence level does need to be close to 100% to make that claim publicly and it's clear they appreciate that. Outstanding catch on the helmet detail. The RS suit is a mix suit of different parts. The holster from the RS suit is to see in that scene but not the whole suit. But i would like to see a pic's where you have spotted the helmet in that scene. The RS suit will never be identified on screen, only parts of it will. It's a mix and match of parts so it would be virtually impossible to identify it. I would imagine that the trooper armour got juggled around between takes and even more so after filming, so I wouldn't expect any possible found suits in the future will match any on screen. I am sure as time goes by that more and more photos will emerge from behind the scenes, we may possibly identify certain parts, but matching them on screen will be tough.